Up until about 12 months ago, you never really knew what you were going to get out of Kyle Gibson. Who was going to show up? Good Gibby, or bad Gibby? Since, Kyle has been remarkably reliable, until tonight. This was next level. This was Gibson’s transformation in its final form. This was the arrival of Gibby the Great. Hell of a start by Gibson. This is a Red Sox team he was facing that has the best lineup in baseball and he held them to a single run on four hits over eight innings of work. He threw 120 pitches and racked up seven strikeouts against just two walks. Mookie Betts, Andrew Benintendi and J.D. Martinez have been three of the most dangerous hitters in the game, but combined to go just 1-for-11 with a walk and four strikeouts against Gibby the Great. Gibson’s demeanor on the mound also matched the performance. Kyle just looked like he was in control, in the zone. He ended his night by striking out Martinez swinging, the kind of a moment that could send chills up and down your spine and give you goosebumps. 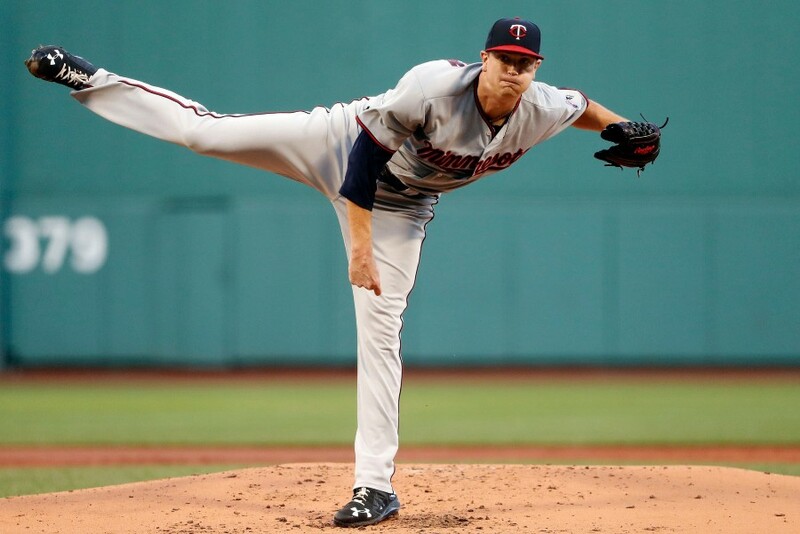 Could this be his last start for the Twins? I wouldn’t bet on it, but I’m certain contending teams are hounding the Twins’ front office right now to check in on his availability. OK, so the Fernando Rodney Experience is the real deal. We’ve certainly seen glimpses of the FRE up to this point, but this was intense. Rodney, who clearly did not have his changeup working at all, labored in the ninth. He also loves to work methodically. You could see where this would be to his benefit, establishing that he is in control, but as a fan, holy cow is it torturous. Rodney gave up a leadoff single, but then managed to retire the next two batters in short order. 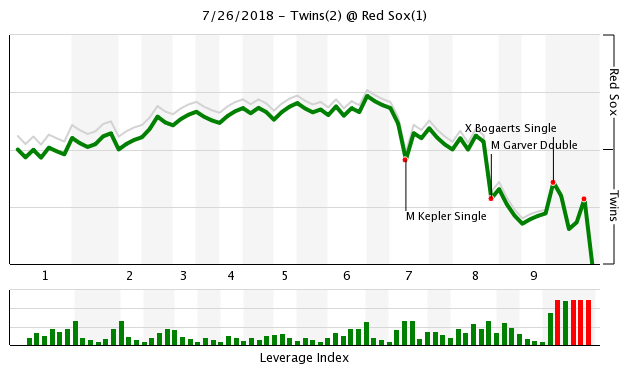 Things swung completely back the other direction, as the next two batters walked. With the bases loaded and two outs, Rodney fell behind Jackie Bradley Jr. 3-0. Just when you were convinced this was going to end in catastrophe … three-straight strikes, SIT DOWN, GAME OHVAH!!!!! Mitch Garver. He was the DH tonight over Logan Morrison and delivered the game-winning hit, an RBI double in the eighth inning. OK, so Robbie Grossman and Brian Dozier deserve some credit too. Grossman led off the seventh inning with a single, went first-to-third on a Max Kepler single and then scored the game-tying run on a double play ball. Dozier drew a one-out walk in the eighth, stole second base and then came around to score on that clutch Garver double. Ehire Adrianza also deserves a tip of the cap for making a great defensive play at shortstop late in this one. Help me out here, assuming Gibson has finally broken the code, why in the world would we want to trade him? Yeah I’d be more keen on extending Gibby than trading him. We have a helluva time developing top of the rotation guys. Gibby might turn into a 2/3. If we can get a true ace and slot Berrios 2 and Gibson 3 we have a rotation that could win playoff series. God what a fun game. Yeah, me too. This is the guy that absolutely shut down the Yankees in Yankee stadium earlier this year too. ... unless WPA in this context stands for Whoops! Pooped Again. Then he had about 3WPA for me. Rodney, who clearly did not have his changeup working at all, labored in the ninth. He also loves to work methodically. You could see where this would be to his benefit, establishing that he is in control, but as a fan, holy cow is it tortuous. Please wait for the ride to a complete stop.When it does, raise the safety bar up over your head, grab small children by the hand, and exit to your left.Thank you for riding the Fernando Rodney Experience and enjoy the rest of your day here at Six Flags." "Well Rodney came through just like we all thought - by scaring the crap out of us." It would be so totally foolish to trade Gibson. To all the Gibson doubters.... I say it for him...... "Bite Me." Because the trade could make the team better?He's the best trade chip they have? Chris Sale has a career 4.12 ERA against the Twins. I like our chances. Yup. That is what we need. More prospects that may never ever get out of the minors, and if they do are years away. Who needs reliable MLB pitchers, anyway? Just every team, including this one. Me too. Also against Rick Porcello and his fake beard. And Eovaldi? Fuggetaboutit. Better when? If they are certain the trade makes them a better team in 2019, I am all in. If not, I would keep Gibson. Too much can happen to prospects whose prime is 4-5 years away. No one wants to trade Gibson because they are a "hater", that's preposterous.Seriously. He's 31 at the end of the year, 32 by the end of his team control.He's not a long-term asset, so it's worthwhile to see what long-term assets he might yield in a trade. The question was asked, I answered it.We don't know what teams are offering, so I have no idea what I would do.It would be more foolish not to listen. I’d rather have 1.4 years of Gibson. Easily. Not with Lynn on the mound though. Depends on the return.You don't have to deal him, but you should shop him. Getting blinded by immediate returns/value over long-term value is just as good a way to make mistakes as the reverse. That was an absolutely amazing pitching performance by Kyle Gibson. All I can say is wow, sheer brilliance. I was watching with my son in law, a huge Red Sox fan, and he couldn't believe that Gibson shut down that potent line up. Then, when I saw Rodney come in, I said hold on, you're not going to believe what's about to happen. He will walk 3 batters and who knows what. Sure enough, Rodney did. He//, he was bouncing balls to the last batter. Count is 3 and 0, I said batter doesn't need to swing at anything, then 3 consecutive strikes. I'm like, are you kidding me. What a game, life is really good. Four of our starting fielders have been out or below replacement all season. Our staff “ace” has been out all season. Our big free agent SP and power hitting DH have been duds. Our other SP acquisition has been... not good. An awful lot has gone wrong ... and we’re “sweep the royals instead” away from being 4 games out. I dunno if we’ll contend in 2018 or 2019. But I’ll take my chances with Gibson and Berrios anchoring the staff. Prospects are definitely a gamble, and I'm not sold on dealing Gibson.He's in his 30's, so age has to at least be considered as well.Without no reported offers, it's impossible to say if I would deal him or not. If the Twins are blown away by an offer for Gibson, I'm fine with trading him.But beyond that extending him over the offseason is looking pretty palatable.I wouldn't want to go very long in years.But something like 3/40 would be awesome, but probably too light. How can you say that without knowing the alternative? Sure, that's true.But the Twins have an exclusive opportunity to extend him, not much money on the books, and a keen need for top and mid starting pitching.There's more value in keeping then you're letting on. To be fair, do we ever know the alternative when they aren't traded?